Our chiropractor serves Tracy CA and the surrounding area at Ringer Chiropractic. Our facility sees patients who suffer from a wide range of issues that affect the soft tissue in the body. One common issue is plantar fasciitis, which will cause a patient to experience heel pain. Plantar fasciitis is an inflammation of the thick tissue located along the bottom of your foot. This particular tissue is what connects your heel to your toes and is one of the most common causes of heel pain. Upon your first few steps of the day, you may notice a stabbing pain in the under portion of your feet if you have plantar fasciitis. Usually, this pain will decrease as the day goes on. You might have the same pain if you stand for prolonged periods of time or stand up after sitting. People who are most at risk for plantar fasciitis are runners, those who wear unsupportive shoes or those who are overweight. Typically, your plantar fascia absorbs the shock you put on it when you walk. Its purpose is to support the arch of your foot. However, too much tension will cause tiny tears in the fascia. Repetitive motions and tears irritate the tissue. Certain people are more at risk for plantar fasciitis than others such as those between the ages of 40 and 60 years of age. People who participate in running, ballet dancing or aerobic dance are most at risk. If you're flat-footed or have a high arch, you're more likely to develop this condition. If you don't walk normally, the way weight is distributed could cause stress on the plantar fascia. Teachers, factory workers and other occupations that spend a great deal of time on their feet are more at risk for this condition. The main plantar fasciitis treatment we recommend for most of our patients is exercise therapy. 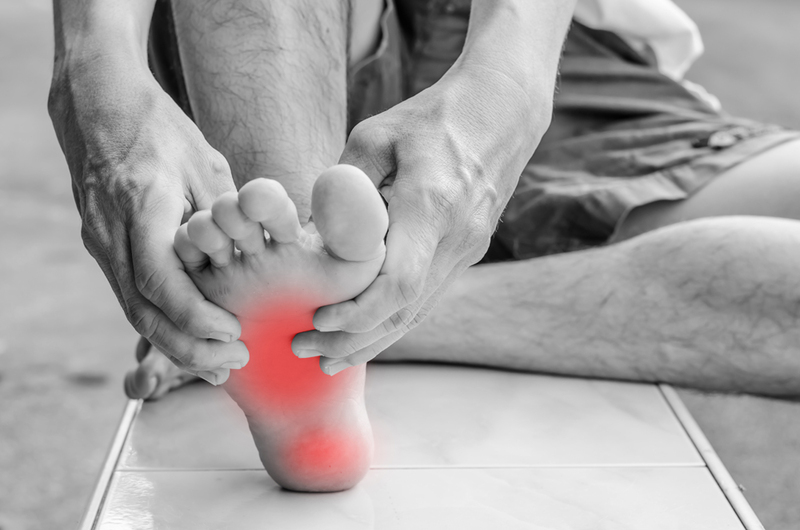 During this particular treatment, our chiropractor will guide you through foot exercises that'll stretch the muscles and other soft tissue in your foot in an effort to loosen the tissue. This helps to relieve pain, and it initiates the recovery process. You'll start out slowly and gradually the exercises will increase as your condition heals. Massage therapy could benefit your condition. Our licensed massage therapist performs a massage on your foot in order to reduce the tension in the injured area, which reduces your pain. The massage stimulates the flow of blood to the area, so more of the nutrients required for healing reach the injured area, ultimately speeding up your healing time. Our chiropractor may tape your foot using athletic tape to support the tissue. Our chiropractor may prescribe a splint for you to wear at night that'll support the soft tissue while you sleep. Our chiropractor may recommend an over-the-counter pain reliever to reduce your discomfort or promote a more effective recovery since you'll be able to perform exercises more optimally when you're not in pain. Our chiropractor may use heat and cold therapy to provide you with relief from pain and inflammation. At Ringer Chiropractic, we serve all of Tracy CA and the surrounding area to help patients find the best plantar fasciitis pain relief. Give us a call at at 209-835-2225.